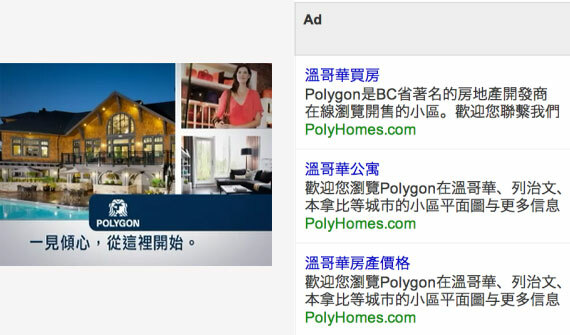 Sheng Li Digital helped our real estate client, Polygon Homes, utilize social media, search engine marketing, and targeted media buys on local Chinese websites to introduce their residential properties to an international community. Conversions, in the form of sales leads from their website, increased by 32%. Polygon Homes, a well-established and highly respected home builder, was looking to tap into an international market and reach foreign real estate investors from China, as well as a North American Chinese audience. Polygon was building housing communities around Greater Vancouver, ranging from concrete high-rises to wood-frame condominiums, townhomes and single-family communities. Vancouver, Canada has a unique ethnically-diverse population, and Polygon wanted to publicize their houses to Chinese investors. We identified that there was a significant number of people in the Chinese-speaking demographic researching North American real estate online, both from China and within the US and Canada. To drive more leads and ultimately more sales, we knew that we needed to have a strong online presence on the social media and search engine platforms this demographic uses. The goal was to get prospective buyers to register online using a registration form on the website. 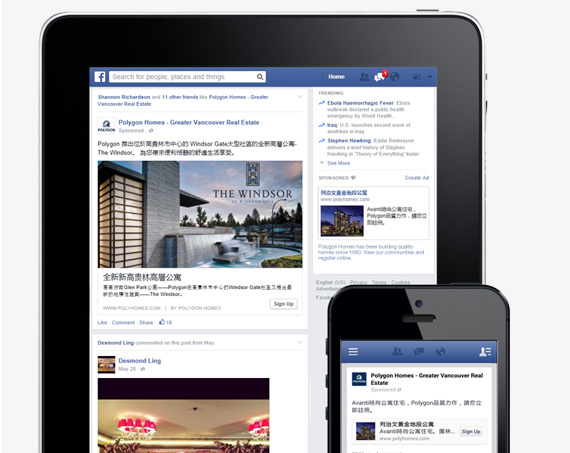 Sheng Li Digital helped Polygon Homes navigate the international realm. To drum up enthusiasm for their properties, we looked at the most efficient media channels for positioning Polygon’s presence in the Chinese market. Ultimately, the objective was to increase Polygon’s exposure in the online marketplace while delivering a lower cost per sale. We created landing pages utilizing traditional Chinese text and imagery unique to the interests and cultural nuances of the demographic. These pages were optimized, connecting to the terms prospective buyers searched. Facebook ads were created, executed, and amplified in Chinese, using both geo-targeting functionality and recognizing when visitors were using Chinese web browser settings. We launched search engine marketing campaigns in Google as well as image ad targeting on the Google Display Network (GDN). Through Google AdWords remarketing, the properties were remarketed to the audience who visited the website but did not register as buyers. A social media campaign was set up and a Weibo account was created and verified for Polygon Homes. 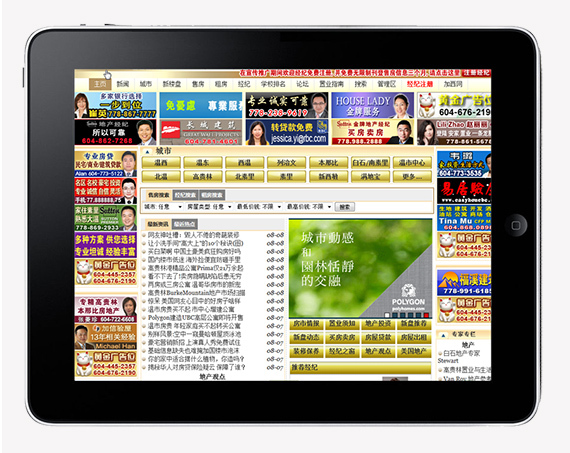 We added custom imagery and promoted the account used paid advertising to the Chinese community. Weibo posts were created and we performed community management to engage with this audience. Sheng Li drove traffic to Polygon’s landing pages and ultimately the online registration system through a combination of smart media buys and integrated social media campaigns. In summary, this involved media buying on relevant Chinese websites, effective Weibo posts, Facebook, and optimized Google AdWords campaigns. Nothing got lost in translation. Sheng Li leveraged these channels to target a Chinese-speaking customer base and achieved tremendous results for Polygon Homes. Not only did Polygon Homes see an improved return on investment (ROI), but they were also able to spend online advertising dollars more effectively and efficiently. 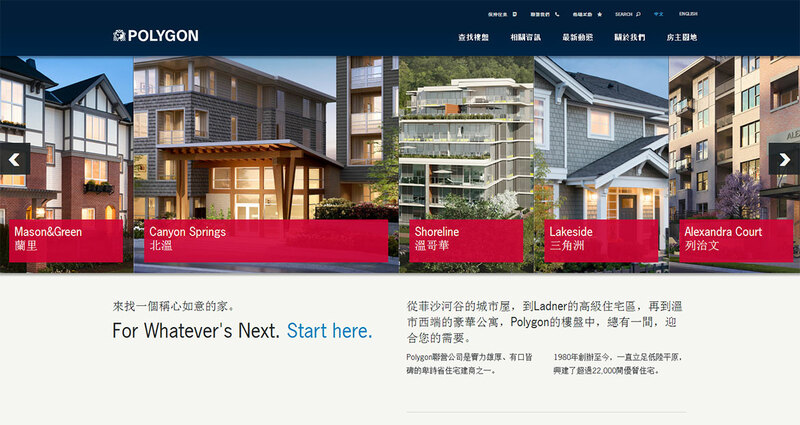 Sheng Li Digital helped build a solid foundation for a strong digital marketing presence online, and Polygon Homes became the talk of the town in Vancouver’s bustling Chinese community.